Upset at getting a parking ticket but don’t have the will to fight it? Don’t despair – there’s now an app for that. Company Fixed has created a smartphone app that automates the process of challenging San Francisco parking tickets by collecting evidence and connecting drivers with ticket advocates. The app is quite simple. 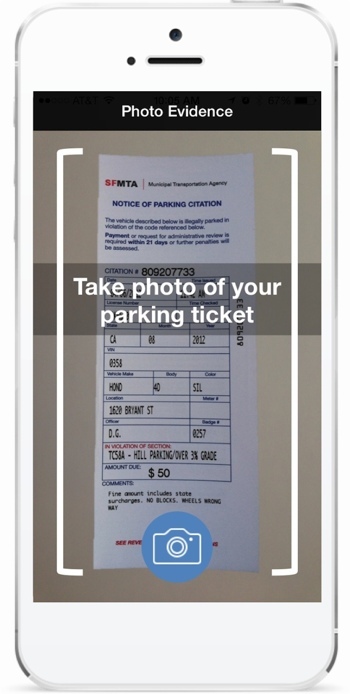 You start by taking a picture of your ticket with the app. It’s then automatically analyzed, with the app informing you of the probability of successfully contesting the ticket based on the violation code. If you choose to contest the ticket, the app will suggest possible ticket defenses (e.g., broken meter, missing signs) and ask you to help supply evidence for the case. Fixed also brings its own data collection efforts to the table. Contest a red curb parking violation, for instance, and Fixed will check city records to see when it was last painted. “The more tickets we contest, the smarter we become about recognizing the most common errors and knowing the best contest reasons,” the company explains. Fixed charges 25% of the original fine as a fee if your challenge is successful and nothing if your challenge is rejected. Many municipalities do, however, charge their own fee for contesting a parking ticket (San Francisco included). For now, the Fixed service is only live in San Francisco. And even then, you may have difficulty signing up. The company warns that "we’ve had unprecedented demand and are oversubscribed in nearly all zip codes." Expansion plans are in the works, with the Fixed team dreaming of one day becoming a one-stop shop for ticket advocacy. Given how predatory parking enforcement officers can be (and how bad my parking habits are), it seems pretty clear there's a market for the app in my household. Fixed has begun maintaining a wait list, which you can join by providing your email address. For more on Fixed, visit the company’s website.